I received a surprise text today. Jeff and I were out in the backyard enjoying a rare Saturday with nothing pressing on the schedule. 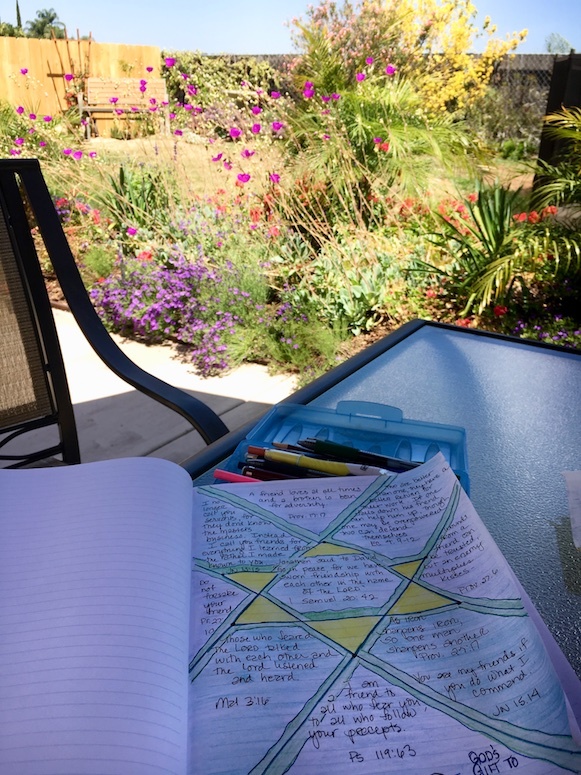 We enjoyed time to reflect as we read our Bibles and talked about goals—those we’d accomplished and those we’d need to pray about as we looked down the road ahead. We are heading into a major life transition, as Jeff is considering retiring after 25 +years as a classroom teacher. 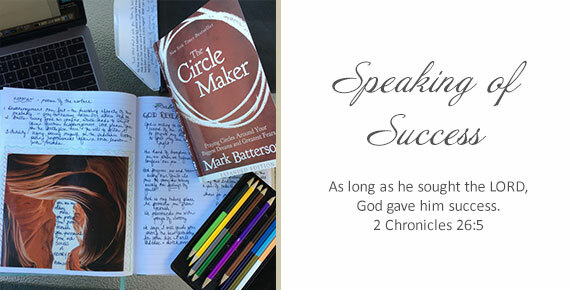 As we sipped coffee, I read aloud to him from a book I’d been reading, The Circle Maker by Mark Batterson. In the opening chapters of this bestselling book about prayer, he recommends that the reader spend some time first in reflection—what I’ve called Inward Inventory in Living Crosswise: Hope and Help for Navigating Transition. The attainment of fame, wealth, or social status. I don’t know about you, but my experience with achieving aims and purposes has not been accompanied by any fame, wealth, or social status. Yet, why do we so readily think of success in terms of the second definition rather than the first? Actually, my circle of friends and family does include best-selling authors, multi-millionaires, musicians who’ve achieved great commercial success, those with advanced degrees and prestigious careers in medicine or industry, even career missionaries in dangerous parts of the world. If I make the mistake of assessing my own success by comparing my life’s accomplishments to theirs—without consulting with the Holy Spirit for perspective—I am heading for a crash on the rocks of low self-esteem, inadequacy, and the feeling of failure. In other words, bloom where you are planted. As we talked about these principles, I was able to encourage Jeff that during his 25 years as a Jr. High teacher, he has had a profound, year-long— in fact lifelong— impact on at least 3500 students at a most impressionable time in their lives. Not only has he bloomed where he’s planted, he has enabled thousands of young people to blossom as well. He was also fulfilling Batterson’s second point in defining success, which is “Help others to maximize their God-given potential.” Although Jeff hasn’t achieved great wealth or fame, he is certainly wildly successful in the way God measures success. Our discussion continued and I pondered my own zig zag path—which lately has not only included a deep professional disappointment, but also a bout with debilitating pain that has lasted for months. Spiritual warfare for me has meant fighting a constant battle with discouragement. It has meant trying to take my thoughts captive and reckoning success or failure by God’s definition, not the world’s. He requires faithfulness, which we can control, rather than results, which we cannot. Psalm 32:8 helped: “I will guide you along the best pathway for your life. I will advise and watch over you.” I did some visual journaling and then wrote out a Pinpoint Prayer, asking God to show me how I might be a good steward with what he has given me to give, and how to best help others to maximize their God-given potential at this particular season in my life. During the very same hour that Jeff and I were talking, a dear friend was on retreat with a lovely young woman who’d attended one of my Creative Conversations with God workshops this past summer. Colleen urged this young woman to text me right then and there to let me see some of the beautiful fruit that had resulted. You probably can’t blame me for connecting the dots and concluding that God was in the process of answering my prayer even before I put words to it. God keeps his promises. He guides us on the best pathways for our lives. He advises and watches over us. And that morning he allowed me to see that I had been successful in helping another to maximize her God-given potential. I asked my new friend Amy Swindle if I could share her name and her gorgeous creative journaling pages with you and she agreed. I hope seeing Amy’s journal pages will inspire you to want to start your own exploration of the Bible using the tools I teach in Creative Conversations with God workshops. 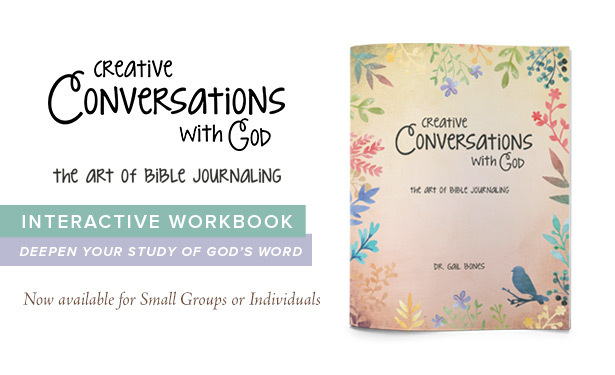 You are also officially invited to join our Facebook group called Creative Conversations Journal Share where you can post and also see the creations of others who have discovered the joys of reading your Bible with more purpose and passion. 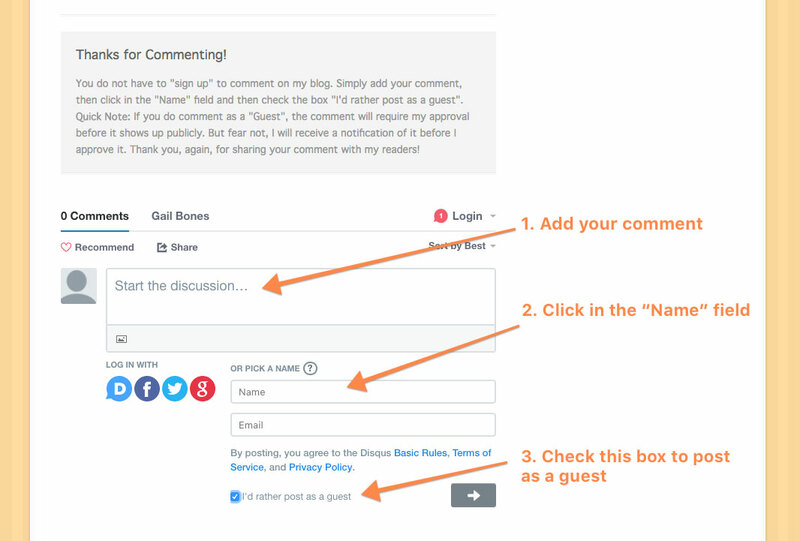 Let’s encourage each other! Success includes helping others achieve their God-given potential! Is there someone you could text today with some life-giving words?